Easter is right around the corner! (April 16, 2017 in case you were wondering like I was. I never seem to know what day Easter or Thanksgiving falls on in any given year, please tell me I'm not alone...) Growing up, we didn't do big fancy Easter baskets but instead, my parents hid little nests of plastic green grass full of candy and we'd have a "hunt" to find them all. Fast forward several months, and sometimes we'd still find old "nests" that were forgotten about! I want to forgo the mess and give my kids Easter baskets instead. Henry will be a month shy of 3 on Easter, and Otto will be just 16 months. 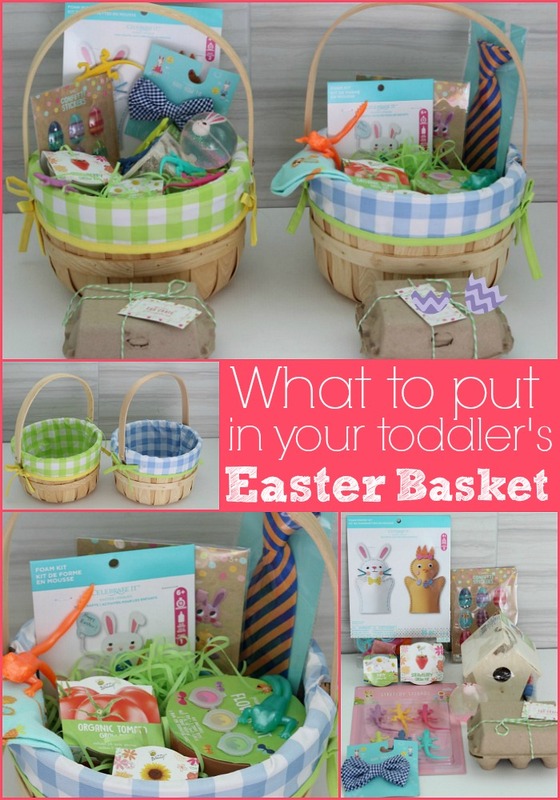 My toddlers aren't big into candy (more on that later) but I've come up with some great alternative ideas on what to put in your toddler's Easter basket. It's not that I'm opposed to my kids eating candy. In moderation, they can eat whatever they'd like. But get this: We went out to eat this week to a European deli that has an amazing bakery attached. After our meal, we headed over to the bakery so that Henry could pick out a treat. He wanted a chocolate chip cookie. I knew he wouldn't like this because he's always spitted out anything with even a trace of chocolate in it, but he was adamant about that dang cookie. So we got that for him, a sugar cookie for Otto and a few treats for me and hubs (that hubs later ate all of, because I take one bite of sugar and feel instantly like crap). We take the sweets to go, and Henry talks about his cookie the whole way home. We let the boys have their treat upon sitting at the table. Henry takes two small bites, looks disgusted, sets his cookie down and says, "I'm done. Can I go play?" Otto ate about a third of his cookie, but homeboy ate almost an entire adult-sized grilled cheese, and I'm pretty sure his belly was maxed out! The next day, I let them split the remainder of the sugar cookie, which both boys loved. Otto, being ever the good eater, wanted more so I broke off part of Henry's chocolate chip cookie. He shoved it in his mouth and frowned. Chewed on for a minute. Then spit the cookie out all on this white onesie. My kids hate chocolate and can barely stomach sweets it seems! My little apples didn't fall far from this mama tree. Before you roll your eyes, don't worry: Put a bowl of chips and salsa or queso in front of me and I will lick it clean. So, clearly the traditional sugar filled Easter baskets won't work for my kids, at least not yet. However, I didn't want to gift them "big" gifts, because this isn't their birthdays. It's a religious holiday that's not centered around getting massive gifts. I wanted to give them small, little things that they'd get a kick out of and spend less than $15 each on it. Dollar spot at Target to the rescue! They had a great selection of little (and cheap!) 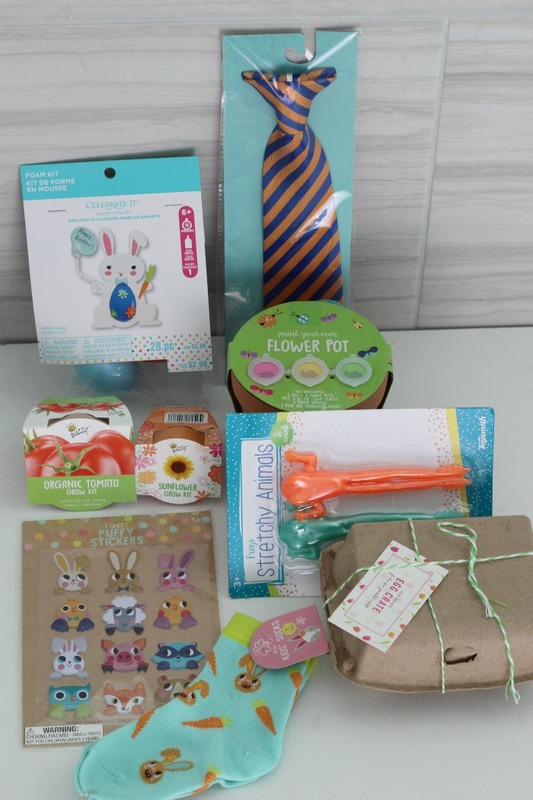 crafts, toys, ties/bow ties and Easter stickers. Perfect fun, inexpensive things for them to play with or for us all to do together as a family without the sugar crash. I didn't get them exactly the same things because here's how things play out in our house: Whatever Otto gets, Henry wants and whatever Henry gets, Otto wants. So I get them slight variations and then they can switch and trade fight over who gets to play with what and when. 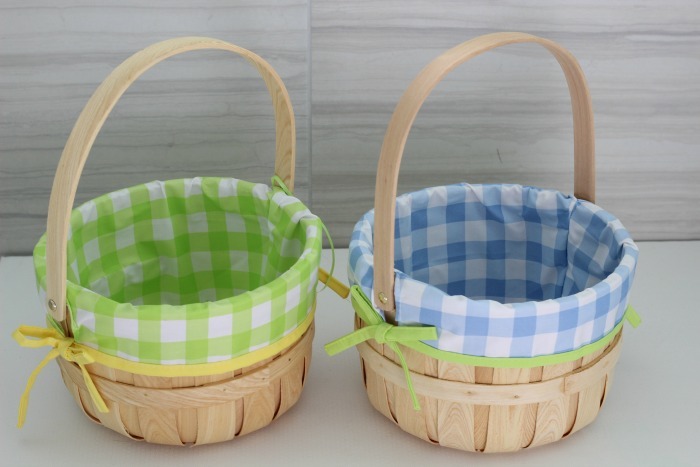 First, want a fabric-lined Easter basket that you can reuse every year? Here's a very similar one to the one in these photos that we reuse every year! Easter is such a fun time of the year! It's spring, everything is blooming and I get to dress my boys up in cute bow ties and ties. Easter baskets are a fun tradition I didn't have growing up, but am excited to do with my own kids. 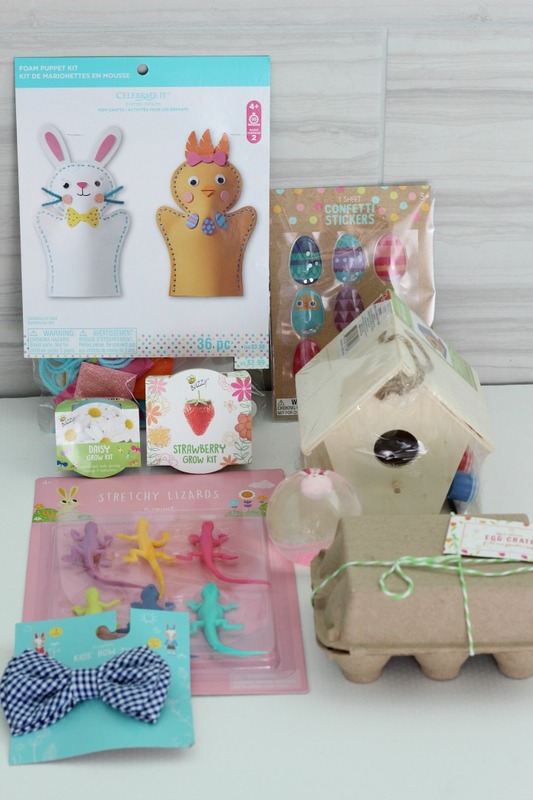 Currently, candy ain't their thang (I'm sure that will change), but there are tons of fun things to put in your toddler's Easter basket that aren't candy! 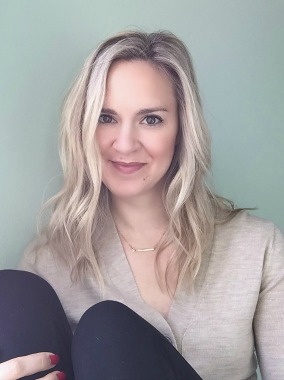 I hope my ideas inspired you to get creative this spring. You are so crafty and creative. I'm very impressed! My mother still makes me an Easter basket but puts like cute PJ's and a bottle of wine in it. I like the grown up version of it hahahaha. The dollar bin at Target is the best. That is where I get all my birthday cards and gift bags. Such cute ideas! Crazy that your kids don't like candy (but good for you for keeping them away from it) - that was always the best part to me, haha. I love those Reese's Eggs! I never put candy in A's Easter basket. That's all we ever got as kids (and money) and I don't want her to have all that junk. I love all the Easter stuff the dollar spot has right now. 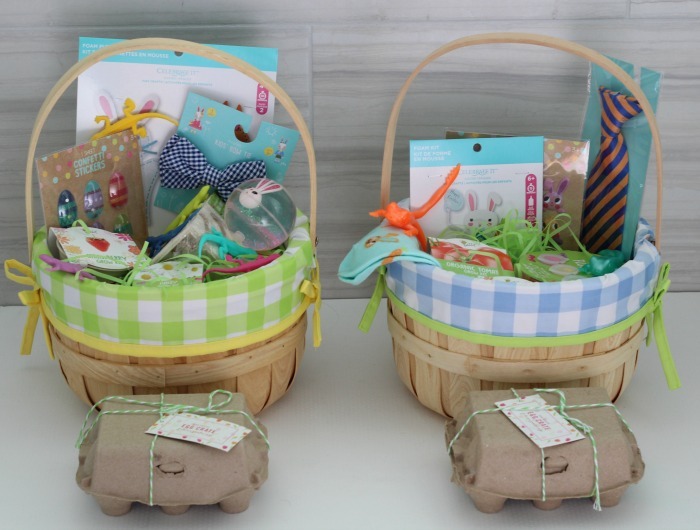 Their baskets are so cute! Great ideas. In our family, we always gave the kids kites for Easter, in addition to a chocolate rabbit. These are some great ideas! I love the little bird house. What a fun craft to include!! The Dollar Spot is the BEST for stuff like this! Great ideas. I feel the same way--I don't like getting big gifts for Easter--it's a super religious holiday. But, outside of the Easter basket from the Easter bunny, I give my kids Easter outfits for Church. love this! thanks for the ideas - i'm always trying to find cute things to give my niece & nephew that isn't more candy.... or the dreaded shopkins! These are great ideas! I'll probably do bubbles, socks, and puppets for my one year old. I love the little plant and seed idea!!! I feel really finicky reading these articles I mean there are writers that can write reasonable stuff best infant toddler bathtub.